After making an instant impact in his maiden Test on Australian soil, India spinner Kuldeep Yadav said he needs "more time" to improve as a Test bowler, stressing that playing red-ball cricket is vital for his growth. India vs Australia 4th Test Sydney: After making an instant impact in his maiden Test on Australian soil, India spinner Kuldeep Yadav said he needs “more time” to improve as a Test bowler, stressing that playing red-ball cricket is vital for his growth. The 24-year-old left-arm wrist spinner scalped three wickets to leave Australia struggling for 236-6 in reply to India’s first-innings score of 622-7 declared on the third day of the fourth Test. Playing in his first overseas Test since Lord’s, Kuldeep also said he was a bit nervous. “To be very honest I haven’t changed anything (for bowling in Australia). I am playing my first Test in this series and so was nervous,” he said on Saturday. Kuldeep said there is no substitute to “match experience” when it comes to improving as a bowler. “Test cricket is similar – the more you play the better you can read batsmen. There is time enough to plan for batsmen, you can bowl more overs and change fields,” he added. “There is more pressure (when you play red ball cricket after white ball cricket) you need at least 10 days as a leg-spinner to change your mindset and control things. 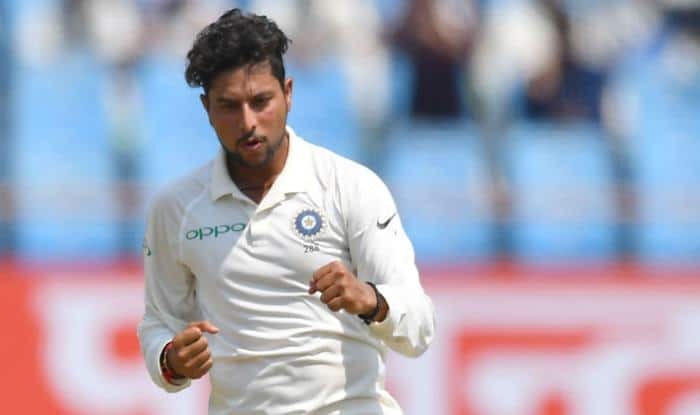 Dropped midway through the England series, Kuldeep said he is motivated to fight for his spot with the presence of R Ashwin and Ravindra Jadeja already in the side. “When I came from Lord’s test, I bowled for a week with my coach and played India-A Test series against Australia-A. I performed well there because when you get a rhythm, the ball comes out well and then I played against West Indies and did well,” he said. “When you know you have Ashwin and Jadeja, best spinners in the world, and you are the third one, so then there is a lot to motivate yourself and learn from them. They keep pushing me in the nets that you have to bowl this way and in good areas. Kuldeep talked about sticking to the basics of spin bowling and beating batsmen in flight, rather than doing too much. “Sometimes it’s hard when batsmen are picking you. You have to keep learning every day and I am still learning every day. England tour was challenging for me, especially the Lord’s Test. I have worked on my bowling with my coach after that. “For a spinner, it’s very important to follow the basic thing of spin bowling gives little flight, turn the ball and land in the perfect area to deceive the batsmen in the air. That’s more important for me and I am still working on that. “I don’t believe in mystery spin; if you are good enough to deceive the batsmen in the air that’s more important for me,” he said. Kuldeep outfoxed Usman Khawaja and later Tim Paine with both batsmen failing to read him in flight and getting dismissed. “I was thinking of bowling wrong ones to Khawaja. A couple of overs ago I was bowling over the wicket and I knew that he would come after me, maybe hit at midwicket or mid-on,” he said. Kuldeep attributed the support he receives from the team and singled out MS Dhoni for helping him out in the limited-overs’ formats. “Definitely, I also get help from senior players like Virat Kohli. Even Rishabh Pant helps me, and all wicket-keepers help spinners telling them what to do,” he said. The visitors have been superb in the field in both Melbourne and Sydney and Kuldeep also praised the Indian fielders for holding their catches. “We have the best fielding coach in R Sridhar. We are really working on slip fielding and catching at short leg, silly point, and general fielding as well. I feel we are the best catching team in the world when it comes to fielding,” he said.